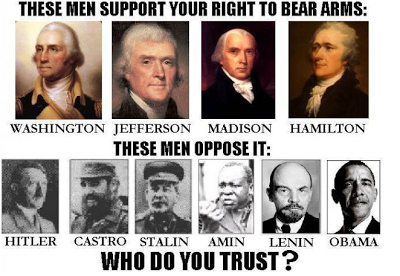 The Second Amendment clearly gives us the constitutional right to defend ourselves and our loved ones against any oppressor, which includes a tyrannical government. Compare this one sentence with Obama’s 15 pages of restrictions, ‘Now is the Time’. We all understand the devastating effects of a shooter gone wild. We all understand that it was the shooter who held the gun/rifle that committed the vicious crime. The Obama administration is seizing the opportunity of using this heinous crime in Newtown, CT to advance his agenda, gun control. My simplistic view of gun ownership seems to have evolved. Guns have always been a part of my life. My mother spoke of my maternal grandfather and uncles hunting for food during the depression, my father spoke of my paternal grandfather shooting to defend himself during the Mexican Revolution. My husband and sons hunt deer for food. My 12-year-old grandsons have been introduced to guns but do not own a rifle unlike my two sons that owned a deer hunting rifle at the age of 12. It should sicken and frighten all of us to read about the history of Nazi Germany and Cuba and their position on gun control. These two countries parallel what is happening in America today. We should also know that Obama is determined on taking our Right of Conscience away from us. First take away our freedom of religion, find a reason to confiscate our guns, next will be to get rid of those that oppose the government. How soon before that happens? RESIST! RED SONJA2013 © PRAY, FIGHT, NEVER GIVE UP! We should never ask doctors and other health care providers to turn a blind eye to the risks posed by guns in the wrong hands. • Clarify that no federal law prevents health care providers from warning law enforcement authorities about threats of violence: Doctors and other mental health professionals play an important role in protecting the safety of their patients and the broader community by reporting direct and credible threats of violence to the authorities. But there is public confusion about whether federal law prohibits such reports about threats of violence. The Department of Health and Human Services is issuing a letter to health care providers clarifying that no federal law prohibits these reports in any way. • Protect the rights of health care providers to talk to their patients about gun safety: Doctors and other health care providers also need to be able to ask about firearms in their patients’ homes and safe storage of those firearms, especially if their patients show signs of certain mental illnesses or if they have a young child or mentally ill family member at home. Some have incorrectly claimed that language in the Affordable Care Act prohibits doctors from asking their patients about guns and gun safety. Hitler took several years to disarm the population using gun registration lists, but Castro moved against private gun ownership the second day he was in power. He sent his thugs throughout the island using the gun registry lists -- compiled by the preceding Batista regime -- to confiscate the people's firearms. Different tactics, same objective. A defenceless people don't give the all-wise leader any lip. Without the restraints of religion and social worship, men become savages. good thing nobody is talking about taking our guns away. But they are talking about limiting what kinds of guns can be manufactured and sold (which won't gain any traction)...and they are talking about regulating responsibility in gun ownership and closing gun show loopholes. Sorry you had to type all of that information for no good reason.